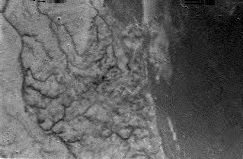 This picture, taken during the Huygens probe's descent, shows what may be channels of some liquid flowing into a large liquid body. Photo Courtesy of NASA/JPL-Caltech. For the first time in human history, a spacecraft has landed on a moon of another planet besides our own. On January 14, 2005, the Huygens probe descended through the constant clouded shroud of Titan and returned photos that will be analyzed for months to come. The transit through the Titanian atmosphere took more than 2 hours. After landing, the spacecraft continued to transmit data for 90 minutes. The probe only had enough power to transmit data for about 7 hours so no more information from the probe will be returned. However, there may be more information that was sent by the probe to the Cassini spacecraft. This information will be sent to earth in the next few days if it hasn't already. A sweeping panorama image was released on January 15 but the image was still being cleaned up as we went to the printers. The Huygens portion of the Cassini mission is a joint project of the ESA and the Italian Space Agency.